The Ultimate Florida Beach Vacation! A beach vacation is one of the top vacation choices in the world. When you’re on your way to “The World’s Most Famous Beach,” it already conjures up images of the East Coast’s best surfing, tropical paradises, palm trees, soothing waves, sandcastle building on splendid coastlines with seemingly endless horizons, water-sports adventures, and the laid-back, soulful sounds of Jimmy Buffet playing in the background as tiki-hut bartenders dazzle with the flipping and spinning of bottles mixing your favorite umbrella-clad concoctions and some one-of-a-kind specialties. Of course, let’s not forget that glorious year-round Florida sunshine and temperate climate. No doubt about it, Daytona Beach is your beach vacation destination paradise, with an extreme variety of activities and adventures for everyone in the family and every travel personality. 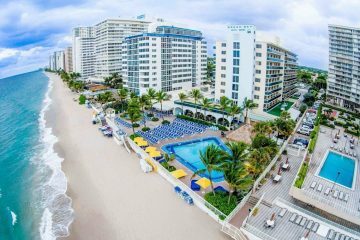 So close up the laptop, and start feeling the warm sand between your toes and gentle ocean breezes as you lounge by the pool or on a pristine beach, completely unwinding and letting loose all of your pent up stresses of daily life. Located on Florida’s east coast, Daytona Beach has 23 miles of playful sandy beaches with aquamarine waters, tons of water sports, plentiful attractions, such as the Daytona International Speedway—home to NASCAR’s great American race, the Daytona 500—and a rich tapestry of arts, culture and heritage ready for exploration. It’s a larger than expected city with a welcoming small home-town feel and gracious locals ready to help immerse you and your loved ones deeply into their city and beach lifestyle. Given its size and proximity to Orlando, an hour away and an easy hour’s straight shot up Interstate Highway I-4 where you can spend a day in the theme-park capital of the world, including Walt Disney World® Resort make sure you have talked to one of our travel representatives about our preferred partnership with Alamo® rental cars so you can come and go at your leisure and enjoy the primly located seaside city and outlying areas offer. Besides the beach, faithful visitors flock to Daytona Beach, Florida, on a regular basis for its jam-packed calendar of events, including NASCAR races, year-round cultural and arts event and festivals, surfing contests, antiques shows, Bike Week and many more. 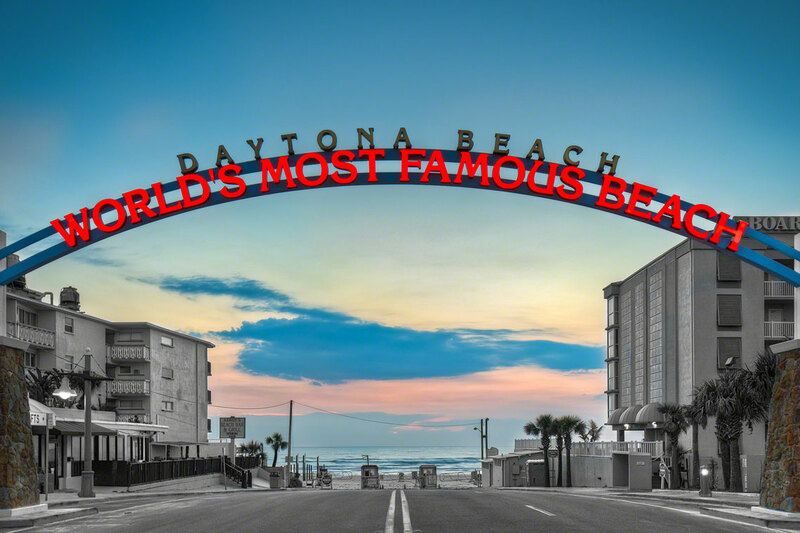 For a guide and better inside look into Daytona Beach, click the Must-Do and Fast Facts buttons on this page. H2O lovers of all varieties and interests—surfing, fishing and deep-sea angling, diving, diving, snorkeling, boat cruises, dolphin spotting, jet skiing, parasailing, water parks, etc.—will find many coastal adventures to whet their whistle. There also is a hearty collection of activities for more nature-loving and adrenaline junky travelers, such as cultural museums, glorious Florida shopping, casual to find dining with the best fresh-caught seafood, world-class golf, Richard Petty Ride-Alongs, historical explorations, eco-safaris, activity-based piers and much, much more. Check online for monthly goings-on in Daytona so you can book your travel early if it is around one of these special events. 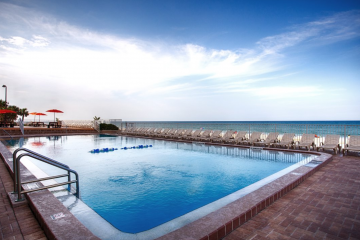 Your accommodations are primly located in the heart of action, so get ready for the most affordable, lower-than-retail costs and many specials, PLUS possible incentives like complimentary accommodations and attraction tickets among your custom vacation packages for the most exciting beach adventure in Daytona Beach – a Florida treasure! More Fun Under The Florida Sun! With glorious sunsets and sea-salt breezes that soothe the soul, you’ll see, Daytona Beach is more than just an exciting, beautiful beach. It’s a year-round destination cradling a wide variety of activities and adventures that appeal to all types of travelers. It’s a primly located Florida beach hot spot and treasured destination for cohabitating couples, individuals and families friendly, boasting a laid-back atmosphere, top-notch surfing, deep-sea diving, fishing expeditions, whale watching, dolphin swims, motor and water sports, and exciting attractions to please every personality and interest, both on and off the water, as you’ll see on our list of Daytona Beach Must-Do activities. When you’ve had enough sun and surf, you can satisfy your cravings for alternative excitement with dynamic and vibrant nightlife that lights up as soon the sun sets, world-class golf like professional LPGA courses for aficionados, chic shopping, gourmet dining and the best and freshest Florida seafood, thrill-seeking Boardwalk rides, and pedal-to-the-metal NASCAR ride-alongs and solo driving experiences at the Richard Petty Experience. 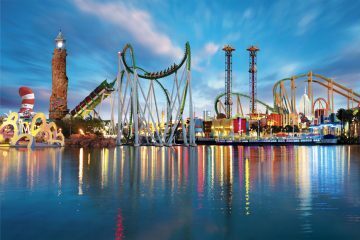 Plus, Daytona’s close proximity to outlying areas worth exploring like Orlando, Cape Canaveral and New Smyrna puts you in the driver’s seat for double the fun, double the pleasure.